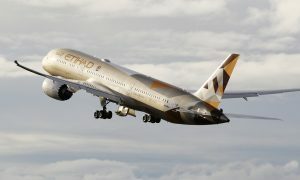 Etihad Airways announced that its is to increase capacity on its Dublin-Abu Dhabi service by deploying a Boeing 777-300ER on the route from July 2, 2013. The Boeing 777-300ER will operate on the six EY42 flights out of Dublin, increasing capacity on the route by 34%. The increase will provide an additional 900 seats each week compared to the current schedule. 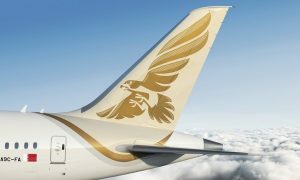 “Dublin is one of our most successful routes and this increase in capacity is indicative of the confidence we have that demand, especially in the premium cabin, will continue to grow,” said James Hogan, Etihad Airways’ President and Chief Executive Officer. Etihad Airways carried more than 215,000 passengers between Abu Dhabi and Dublin in 2012, with the route in the airline’s top 10 most popular. The 900 extra weekly seats includes with an extra 36 seats in the award-winning Pearl Business class and 864 in Coral Economy. An Airbus A330-200 will continue to operate on the four EY48 flights from Dublin. The B777-300ER is configured to carry 412 passengers, with 28 seats in Pearl Business Class and 384 in Coral Economy Class. Etihad Airways launched its services to Ireland in July 2007 with an initial four flights per week, increasing to six and then moving to a daily service in March 2008. This was further increased to the current service of 10 flights per week in March 2010. Etihad Airways is involved with a number of activities during The Gathering, which includes bringing teams from the Arabian Gulf, Asia and Australia to Ireland in September to take part in the International Hurling Festival. 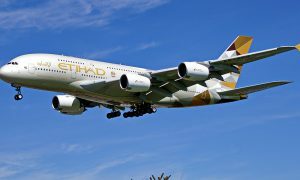 The increase in capacity is a reflection of the strong demand from Irish customers for the route to Abu Dhabi and allows travellers to connect with Etihad Airways global network with Australia, Thailand and India as some of the most popular onward destinations.